Losers ransomware virus is a new strain of the Nemesis family of ransomware that encrypts data and blackmails the victims. The computer criminals rename all affected files with the .losers extension and demand a fee of 500 US dollars in Bitcoin. Victims can eliminate the dangerous ransomware and avoid ransom payment by following our removal guide. How Does Losers Ransomware Virus Infiltrate the System? The research shows that the Losers crypto virus is distributed in single binary executable files all appearing with a random name. This allows the criminals to use different strategies to distribute the threat. A popular tactic for spreading ransomware samples is the use of social engineering spam messages. The hackers send large-scale messages that imitate well-known companies or even government agencies. The Losers ransomware virus payload can either be attached or linked in the body of the messages. The threat can also be contained in infected files. They can be either Office documents (databases, spreadsheets or rich text documents) containing malicious scripts. When they are opened a prompt appears that asks the users to enable them. If this is done the Losers virus is downloaded from a third-party server and executed on the local machine. Another type of infected file is the malicious software installer bundle. The hackers bundle the virus in legitimate and well-known software that are commonly downloaded from the Internet. They modified files are uploaded to hacked or hacker-controlled download sites. P2P networks like BitTorrent are another popular source. 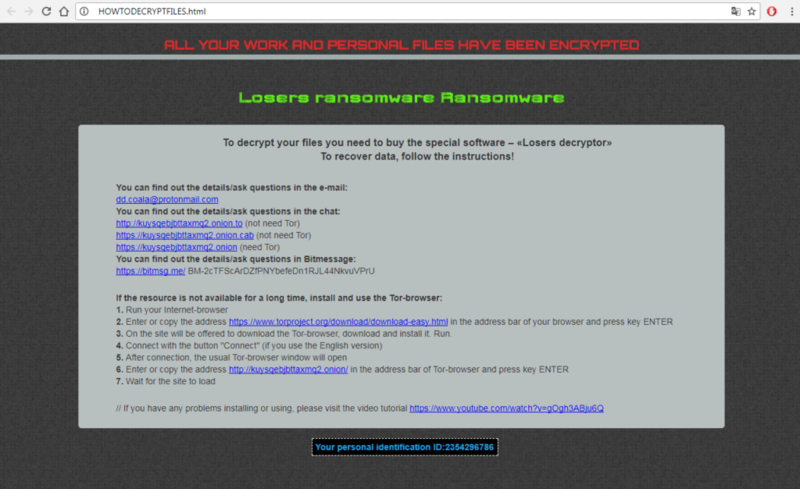 Losers ransomware shares the same ransomware family as Nemesis, CryptON and X3M crypto viruses. It uses the typical infection patterns of a data locker ransomware by activating its encryption engine upon infection. The note of the Losers ransomware states that your files are encrypted and a ransom of 500 US dollars in the Bitcoin cryptocurrency should be paid to retrieve the decryption key. However, it is better to avoid any payments to criminals and try to recover encrypted files via alternative methods. There is no guarantee that criminals will send a working solution after the payment is transferred. Please note that paying the requested ransom fee to cyber criminals does not really solve your problem with Losers virus. In fact, you only encourage hackers to continue spreading ransomware this way. Instead, you must remove the threat immediately, and only then look for ways to recover your data with a data recovery tool. WARNING! Manual removal of Losers ransomware virus requires being familiar with system files and registries. Removing important data accidentally can lead to permanent system damage. If you don’t feel comfortable with manual instructions, download a powerful anti-malware tool that will scan your system for malware and clean it safely for you. WARNING! All files and objects associated with Losers ransomware virus should be removed from the infected PC before any data recovery attempts. Otherwise the virus may encrypt restored files. Furthermore, a backup of all encrypted files stored on external media is highly recommendable.